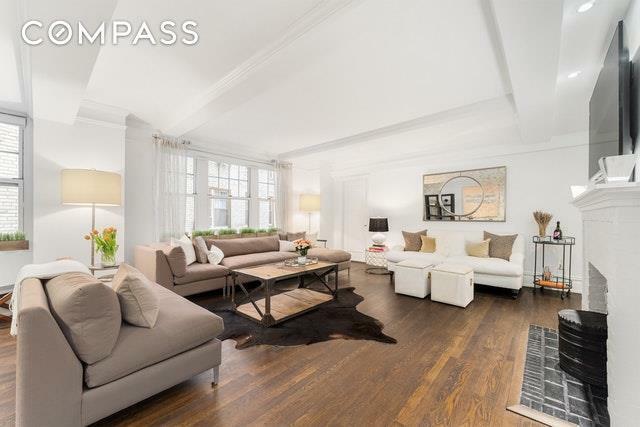 This elegant three bedroom three and a half bath residence conjures the pre-war aesthetic of 2 Horatio Street to create a space that is modern and sophisticated while preserving its underlying character. 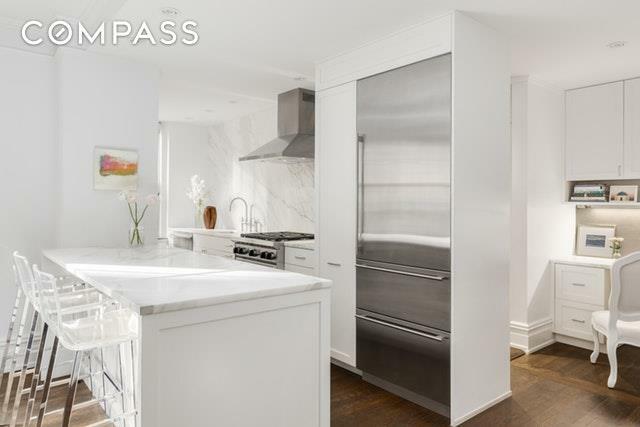 The buildings distinct Bing & Bing design is reflected inthe superb renovation of the home.Three apartments have been seamlessly combined to culminate an exceptional layout,unparalleled proportions, and triple exposures to the east, west, and south allowing natural light to illuminate the home. 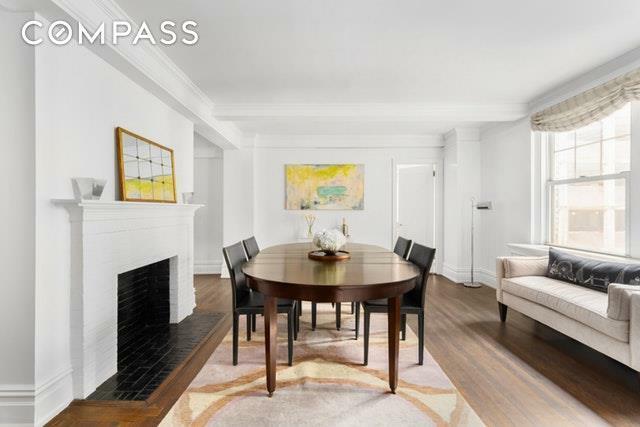 Enter the apartment into the sprawling great room, which is tastefully appointed with Jacobean stained original hardwood floors, beamed ceilings, and crown and picture molding. Separating the living and dining areas are two decorative fireplaces standing back to back with a bar in between. Facing the dining area is an open windowed chef's kitchen adorned with Calacatta gold honed marble countertops, island/breakfast bar and backsplash, custom white cabinetry, a large pantry, SubZero refrigerator, Wolf oven range, and Miele dishwasher.The sun-soaked south-facing master suite occupies its own wing of the apartment, flaunting an enormous customized walk-in closet, lavish windowed dressing room, and an en-suite bath. The luxe master bath is outfitted with calacatta gold honed marble countertops and shower with Dornbracht rain shower head, double-sink vanity with Dornbracht wall-mounted faucets, separate makeup vanity, and ample cabinet space.Adjacent to the great room are two equally spacious and bright bedrooms with walk-in closets and en-suite bathrooms. The residence also features a powder room, through-wall air conditioning, integrated Bose home theater system, plenty of storage, and an individual private storage unit in the basement.2 Horatio Streetis a full-service cooperative offering a 24-hour doorman, live-in super, common laundry room, and bike storage.The building's enviable location in the historic West Village provides access to impeccable restaurants, shopping, and nightlife. Just steps away are the High Line, Hudson River Park, and A,C,E subway lines. Please contact the seller's agent to schedule a viewing!